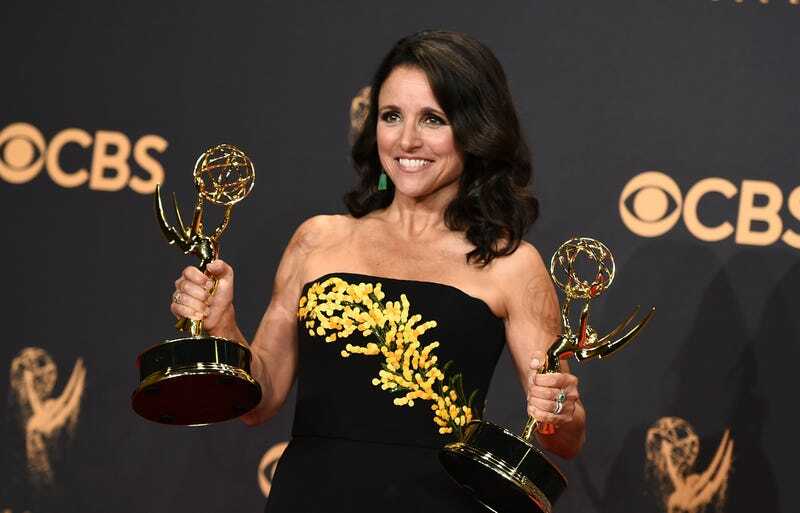 No stranger to accolades, here Julia Louis-Dreyfus double fists her Emmys. On Wednesday, the John F. Kennedy Center for Performing Arts announced that this year’s prestigious Mark Twain Prize for American Humor will go to the great Julia Louis-Dreyfus. The New York Times reported that Kennedy Center president Deborah Rutter said in a statement, “Like Mark Twain, Julia has enriched American culture with her iconic, unforgettable, and outright hilarious brand of humor. Over four decades, her wildly original characters and her gift for physical comedy have left us in stitches.” Past winners of the award include Tina Fey, Will Ferrell, Eddie Murphy, Lily Tomlin, and Richard Pryor. Oh and (yikes) Bill Cosby in 2009, an honor that has since been rescinded. Most recently, Louis-Dreyfus has won a record-smashing six consecutive Emmys for her role as sometimes Vice-President Selina Meyer on HBO’s Veep. She of course played Elaine Benes on Seinfeld in the ’90s, Christine Campbell in The New Adventures of Old Christine—plus stints on Arrested Development, Curb Your Enthusiasm, and others—and she’s actually won 11 Emmys in total. I love her, go Julia!